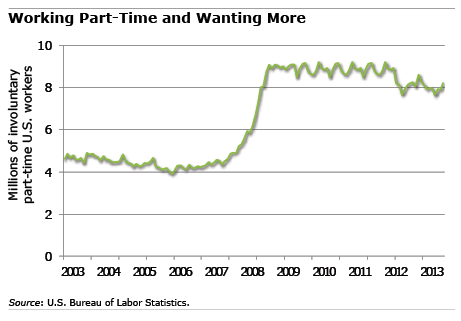 Millions of Americans work part-time because they want to, but this involuntary part-time workforce is one more gauge of the slack labor market and lingering pain three years after the Great Recession officially ended. The Labor Department counts part-timers as involuntary if they can’t find a full-time job or if they work part-time for economic reasons, say a construction worker who doesn’t have enough projects to keep busy. Ohio University graduate Blain Logan, who recently returned from a Peace Corps stint in Mongolia, has looked for more than seven months for the right full-time position to launch his career at a non-profit like Teach For America or AmeriCorps. It’s been easier to find part-time or retail work – he turned down jobs at Walgreens and Target before accepting a position at ReStore, a Habitat for Humanity outlet in Kent, Ohio, that sells donated building supplies. He’s optimistic and ready to relocate for a full-time position, but he currently earns $8.50 an hour working 35 hours a week, which he said is considered part-time. He wasn’t offered a 401(k) or health benefits, he said. Benefits are scarce for part-time employees like Logan. The Affordable Care Act, when it goes into effect, will fine employers who do not provide health insurance for full-time workers, but there is no such penalty for part-time workers. It’s also more difficult to save for retirement. Just 14 percent of all part-time U.S. workers participated in a 401(k) in 2012, according to the Labor Department’s Employee Benefits Survey. One reason is that only 33 percent of their employers offer the retirement savings plans to part-timers. At age 32, Logan is content in what he considers a temporary situation, thanks to a perspective gained in the Peace Corps. Working at ReStore “is hard work, but I just spent two years working for free,” he said. But for anyone who thinks about retirement – and about the challenges facing Logan’s generation – more part-time workers equals less pension coverage.